Bordeaux isn’t just one of the most highly coveted wine blends in the world; it’s a massive wine region by the same encompassing more than 60 different appellations. 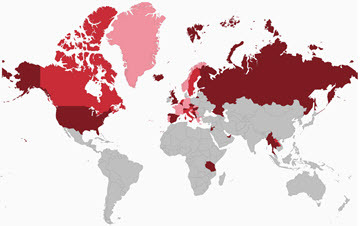 In layman’s terms, that’s more than 7100 different wineries just in Bordeaux alone. Most visitors look for Bordeaux wine tours to whisk them away to the wineries, but the best wine tours in Bordeaux aren’t really “tours” at all. For the truly best Bordeaux wine tours, seek out the unique curated experiences exclusively offered by the châteaux themselves. 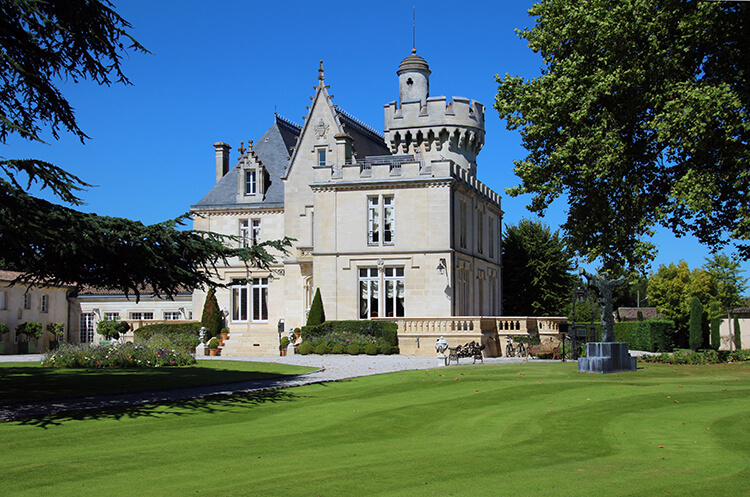 Many châteaux (wineries) offer classic visits with a wine tasting in Bordeaux. You see the vineyard and learn about the terroir; visit the winery, barrel room and possibly tour part of the château itself if it is open to the public. The approximately 45-minute tour is followed by a tasting of 1-2 vintages and usually a second wine produced by the estate. In all honesty, there’s not a lot in these classic visits that distinguish one château from the next. And it’s these classic visits that are offered as part of most small group Bordeaux vineyard tours. That’s why we’ve sought out the most unique wine tasting experiences in Bordeaux. These are the ones that will make your trip to Bordeaux memorable and leave your friends back home jealous while you’re wine tasting in a 200 year old tree top or blending your own bottle of Bordeaux. Ready for the coolest wine tastings around? Then don’t miss these best chateaux in Bordeaux to visit for unique wine tasting experiences. Bordeaux’s Left Bank is home to some of the most famous vineyards in all of the Bordeaux wine region. It’s on the Left Bank that you’ll find all of the 1855 classified Bordeaux wines of the Médoc, including world-famous names like Château Margaux, Château Lafite and Château Mouton Rothschild. Some of our own personal favorites when it comes to appellations, like Pauillac, are located on the Left Bank. Cabernet Sauvignon is the dominant grape found in Bordeaux blends from the Left Bank. A small amount of Petit Verdot and even Malbec can be found in the blends, particularly from very hot years like 2016 when these grape varietals do particularly well. The best Bordeaux vintages include 2016, 2015, 2010, 2009, 2006 and 2005 from the last decade or so. Bordeaux wine from the Left Bank is generally more powerful and made for aging. We often don’t realize how all of our senses work together to help us explore the world around us. Even though it would seem we mostly use taste and smell when drinking wine, it’s amazing how sight and even sound influence how we think and feel about wine. The 5 Senses tour at Château Pape Clement, in Bordeaux’s Pessac-Léognan appellation, engages all the senses. Wine tasting isn’t just reserved for the end of the tour, either. Tastings take place all throughout the tour. There’s a tasting of barrel samples in Château Pape Clement’s barrel room, which is interesting as the grape varieties in a Bordeaux blend ferment and age separately before the final blending. The blind tasting in one of the rooms of the château tests your palette. You might even be surprised at just how difficult it can be to distinguish a white wine from a red when the color of the wine is masked by black glasses. Finally, sounds are used to see how you feel drinking wine in yet another room of the château. After the Château Pape Clement 5 Senses tour, you’ll definitely believe that recent study by neuroscientists in which they say that wine tasting engages your brain more than math. 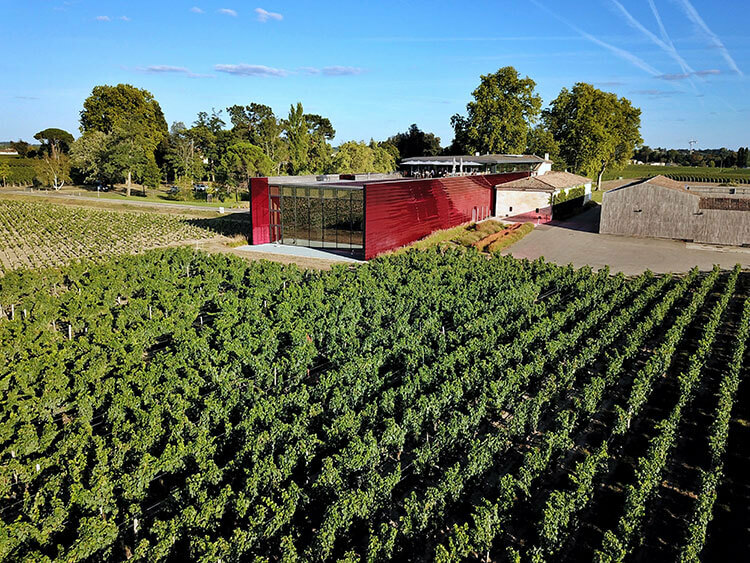 And this tour is far more fun than any math class, which is why we recommend Château Pape Clement as one of the best wineries to visit in Bordeaux. The 5 Senses Tour is available by reservation and is €49 per person. Plan 2 hours for this tasting experience. Château Pape Clement is also easily accessible by public transportation using Bus Line 4 from Gambetta to the Le Monteil (Cité Le Corbusier) stop. It is then about a 10 minute walk for 700 meters to the château. Plan your journey. Bordeaux is renowned for its old vintages, especially when it comes to Bordeaux wines from the Left Bank. While some vintages are so exceptional that they can be drunk in just a few years time, it’s generally best to wait at least 10 years. When you taste vintages on a classic Bordeaux château tour and tasting, you’ll almost always try wines that are fairly young. The aging is still taking place in the bottle and the wines haven’t quite reached their best yet. 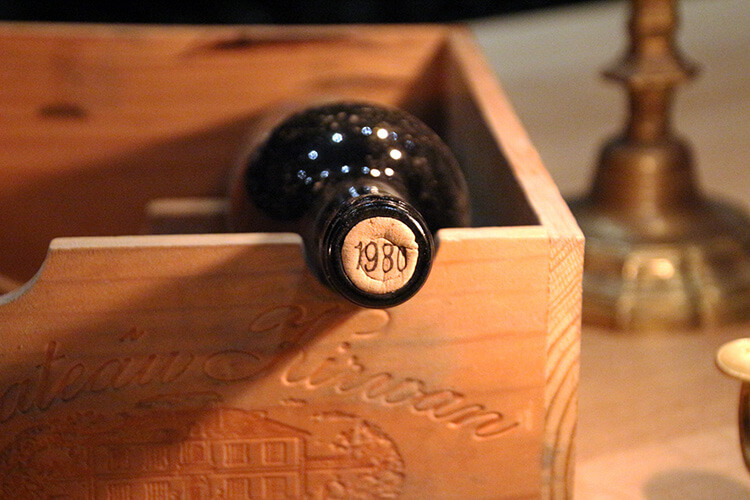 At Château Kirwan, in Bordeaux’s Margaux appellation famous for Grand Cru Classé châteaux, you can taste Bordeaux vintages as old as a vintage from 1967 on the Vintage Tour. This unique experience allows you to choose from a list of vintages for your special tasting. You might select your birth year, the year of your anniversary or some other year special to you. Wines this powerful are best enjoyed with food, so fine cheeses accompany the vintage tasting. It also takes place in Château Kirwan’s cellar among some of their greatest vintages. The Vintage Tour is available by reservation and is €85 per person. Plan 1.5 – 2 hours for this tasting experience. Château Kirwan can be reached from Bordeaux on public transportation. Take the Oui SNCF train from Gare de Bordeaux-Saint-Jean to Gare de Margaux. The château is located 4 kilometers from the village of Margaux, so we recommend taking a vcub shared bike with you and bicycling to the château. vcub costs €1 for a 24 hour membership and €2 per hour for the rental. One thing you won’t be able to do is taste the wine of other Bordeaux châteaux while visiting a vineyard, with the few exceptions of multiple châteaux across different appellations that are owned by the same family. That’s what makes the 1855 Grand Cru Classé Workshop at Château Marquis de Terme so unique. It’s the one Bordeaux château where you will taste the wine of six other châteaux, which are all classified growths in the official 1855 Classification of Bordeaux wines. This workshop is for wine connoisseurs who particularly love Bordeaux’s Left Bank wines. 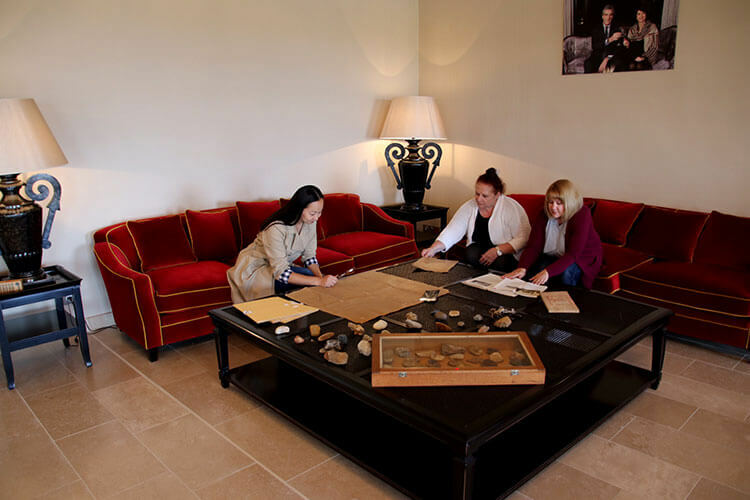 Coupled with a visit to the organic vineyards, vat room and barrel room at Château Marquis de Terme, guests sit down with one of the château’s top guides to learn more about the 1855 Classification and each of the seven appellations that were included in it. 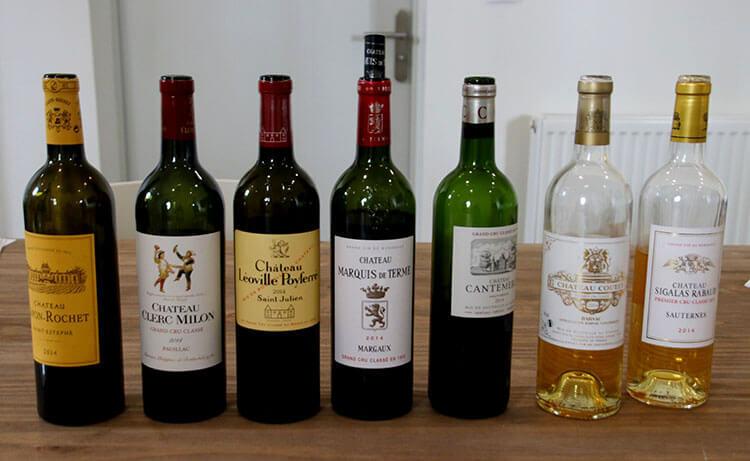 The tasting includes a wine from an 1855 Classified château from each of the Haut-Médoc, Margaux, Saint Julien, Pauillac, Saint Estephe, Sauternes and Barsac appellations. The same vintage is chosen for the tasting so that guests can really appreciate the differences created from the changing terroir as you travel from south to north along Bordeaux’s Left Bank. The 1855 Grand Cru Classé Workshop is available by reservation and is €100 per person. Plan 3 hours for this tasting experience. Château Marquis de Terme can be reached from Bordeaux on public transportation. Take the Oui SNCF train from Gare de Bordeaux-Saint-Jean to Gare de Margaux. The château is 900 meters from the station and is an easy 10-15 minute walk. The Right Bank is home to the well-known appellations of Pomerol and Saint-Émilion, along with many lesser-known satellite appellations. While wine-making didn’t really take center stage on the Left Bank until the 18th century, the Right Bank’s history of wine-making dates back to Roman times. There’s far fewer “heavy-hitters” on the Right Bank when it comes to famous names known the world over. But the Right Bank is extremely popular to visit with far more châteaux open to the public and the ability to combine a winery visit with a stroll through the incredibly charming medieval village of Saint-Émilion. Merlot is the dominant grape on the Right Bank and wines from Pomerol, Saint-Émilion and the satellite appellations have a reputation for being smooth drink-me-soon wines. Exceptional vintages include 2016, 2015, 2010, 2009, 2005, 2003, 2000, 1998 and 1995. Just across the Garonne River on the Right Bank is a little-known Bordeaux appellation: the Entre-Deux-Mers. With vineyards that slope down the hillsides, it’s a naturally beautiful area only 20 minutes drive from the center of Bordeaux. Château de Seguin makes that drive over worth it with the interactive Vitishow. It’s a unique wine tasting experience that marries together going to the a vintage movie theater with wine tasting tours in Bordeaux’s most diverse appellation. Vitishow is an animated and interactive series of short movies along with exhibits that transports visitors back to the year 1920 in Château de Seguin’s vineyard. The movies help visitors understand what happens in the vineyard across all four seasons, the harvest and how the grapes become a fine Bordeaux wine. The self-guided interactive tour inside Château de Seguin’s historic winery ends with a tasting of their wines inside the boutique, which also overlooks the vineyards from a balcony. The Entre-Deux-Mers is one of few Bordeaux appellations where you can taste both white and red Bordeaux. Vitishow at Château de Seguin is open Tuesday through Saturday. Show times are at 10am, 11am, 2pm, 3pm, 4pm and 5pm May 1 – October 31 and at 11am, 2pm, 3pm and 4pm November 1 – April 30. Advance booking is recommended and tickets can be booked online, but walk-ins are also welcome. Plan 1 hour for this tasting experience. Château de Seguin is best accessed by car. There may be over 7100 individual châteaux in Bordeaux, but the wine of every single one is different despite all using the same primary grapes found in the Bordeaux wine region. Wine making and the blends that result is a deeply personal thing with the style of the wine maker shining through. 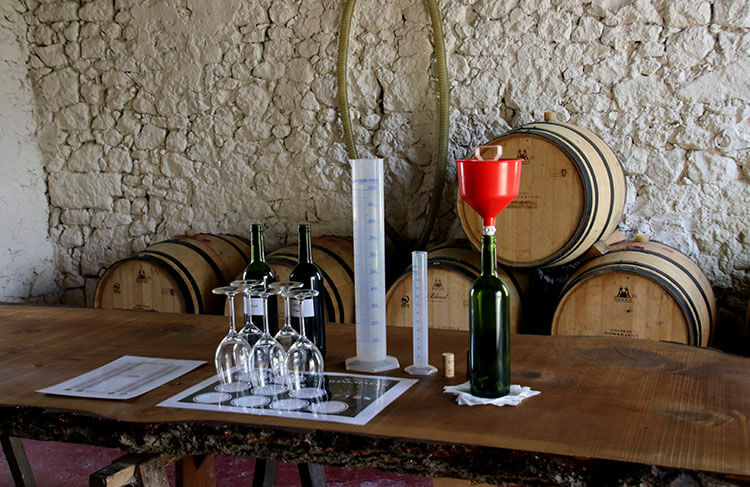 At Château Fombrauge, a Saint-Émilion Grand Cru Classé, you can get a taste for what it’s like to be a wine maker as you blend your very own bottle of wine. It’s like a fun science experiment as you measure out your percentages of Merlot and Cabernet to come up with own personalized blend. After finding just the right blend for your tastes, you even bottle, cap and label your own unique bottle of wine. It’s an excellent souvenir to take home and drink while reminiscing about your trip to Bordeaux. The B Winemaker workshop ends with a classic tour and tasting of Château Fombrauge. The B Winemaker workshop is available by reservation only. Plan 2 hours from this workshop and tasting experience. Château Fombrauge is best accessed with a car. It’s fairly rare to find a château open a Sunday in Bordeaux. 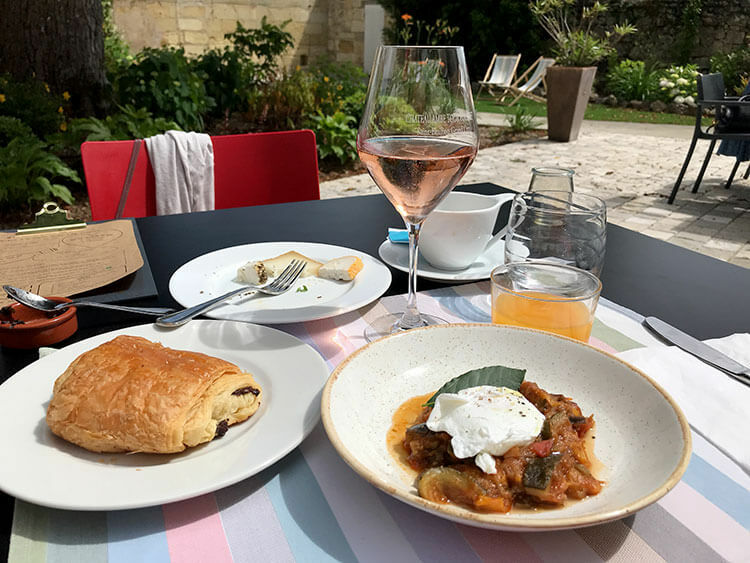 But Château Ambe Tour Pourret, in Saint-Émilion, brings together Sunday brunch and wine tasting. Set in the garden under the château’s iconic tower and in the shade of their 100-year old chestnut tree, this is one of our favorite places to be on a Sunday in spring and summer in Bordeaux. From April through October, Château Ambe Tour Pourret hosts a delicious Sunday brunch on the first Sunday of each month. The brunch theme changes each month and the buffet of dishes reflects that theme. There’s also a hot dish selection cooked to order. And no brunch would be complete without a glass of bubbly! Enjoy a glass of Château Ambe Tour Pourret’s crémant, which comes in white or rosé. Brunch guests can also tour the winery and the tour is offered before brunch. There’s two seatings for brunch, and you can select either the 11am or 1pm seating. The Sunday brunch is available on the first Sunday of each month from April – October at either 11am or 1pm. Plan 1.5 – 2 hours for brunch and the tour. Château Ambe Tour Pourret can be reached by taking the train from Gare de Bordeaux-Saint-Jean to Gare Saint-Émilion. It is a 1.5 kilometer walk from the village of Saint-Émilion to the château. Château La Dominique is among Bordeaux’s most architecturally beautiful châteaux and is famous for its ombre red winery jutting out in to the vineyards from the historic château. The rooftop of the winery is home to La Terrasse Rouge, a gorgeous restaurant with views of the Saint-Émilion and Pomerol vines. Château La Dominique is another of just a few châteaux that open their doors on Sundays (from April to October). Book a discovery tour and tasting of the château either before or after a lunch or before dinner at La Terrasse Rouge. There’s only around a dozen château restaurants set in the Bordeaux vineyards, and the rooftop is the perfect spot to linger over a lunch or dinner. Choose from either a la carte or the 3-course gourmet menu. La Terrasse Rouge is open daily from 12pm – 3pm for lunch and 7pm – 10:30pm for dinner. Reservations highly recommended. The château is open daily from April to October from 10am – 7pm. Plan for 3 hours for the discovery tour and lunch or dinner. Sauternes is something entirely different. It’s the sweet Bordeaux wine appellation in which the micro-climate of the converging rivers creates just the right conditions for botrytis cinerea. This fungus, also known as noble rot, causes the grapes to turn intensely sweet. Sauternes and Barsac are located on the Left Bank about 20 kilometers south of the city. Bordeaux’s only Superior First Growth, world-famous Château d’Yquem, is located in Sauternes. It’s undisputedly one of the best vineyards in Bordeaux. The dominant grape is Semilion, a white wine grape. Great vintages from Sauternes include 2017, 2016, 2015, 2014, 2013, 2011, 2010, 2009, 2008, 2007, 2006, 2005, 2003, 2001 and 1997 from the last 20 years. Sauternes has become one of our personal favorite appellations to visit with a number of the châteaux doing fun and interesting workshops and visits. It’s an appellation we definitely think you should make time to visit at least one châteaux when you visit Bordeaux. One of the most complex wines in the Bordeaux region is Sauternes. If you don’t know Sauternes, it’s the sweet wine made with white grape varietals that contract a fungus called botrytis which highly concentrates the sugars in the grapes. Sauternes is special because this noble rot only occurs in the micro-climate in the Sauternes and Barsac appellations. Château Coutet Barsac helps visitors understand exactly how botrytis affects the grapes and changes them with their Discover Saunternes and Barsac Varietals workshop. What’s particularly interesting about this workshop is that we don’t typically get to actually taste the grapes themselves unless you happen to be visiting Bordeaux in September or October during the harvest. So Château Coutet Barsac makes some of their grapes into jellies, allowing visitors to taste each individual grape varietal year round. You’ll be shocked just how different a Sémillon grapes tastes from a Sémillon grape with botrytis. It’s in this special workshop that you can really appreciate how the blending of the grapes makes up the complex Sauternes blend. Château Coutet Barsac is open by reservation only from Monday – Friday from 9am – 12pm and 1pm – 5pm. Plan 1.5 – 2 hours for the Discover Sauternes and Barsac Varietals workshop. Château Coutet Barsac is best accessed with a car. Sauternes is a wine that has traditionally been drunk during the holidays in the Southwest of France and is classically paired with foie gras. But the younger generations are discovering Sauternes isn’t just for Christmas and with a crusty baguette smeared with foie gras. 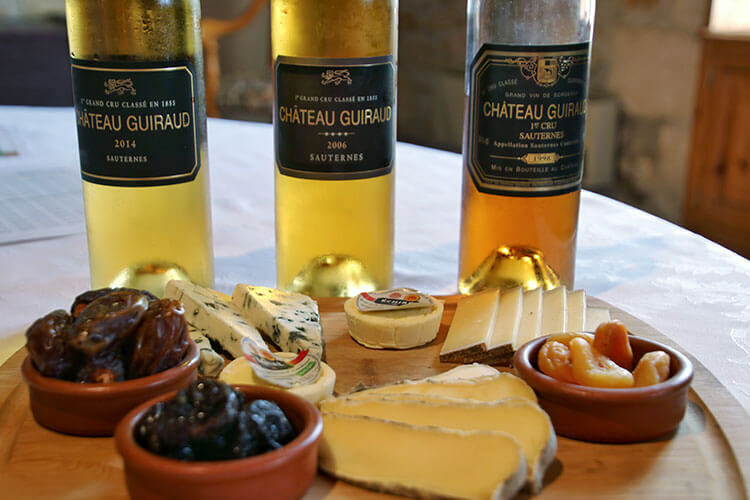 No, this wine actually has many pairing opportunities, and Château Guiraud is keen to show visitors just what a match made in heaven Sauternes and cheese are. Much of the estate tour at Château Guiraud is focused outdoors. Not only is Château Guiraud an 1855 Premier Grand Cru Classé, but they are certified organic. It’s not an easy or simple certification to maintain, and they are extremely proud of their organic certification. Their estate is like its own ecosystem with a vegetable garden that supplies the on-site La Chapelle restaurant, insects and birds that all work together to keep the vines pest free, and other interesting bits like the trees and hedges that contribute to the success of being an organic vineyard. After visiting the winery and barrel room, the visit concludes with a private table set in one of the gorgeous rooms of the château just for you. It’s here that cheese pairings are carefully selected for three Château Guiraud 1855 Premier Cru Classé vintages that you’ll taste. Château Guiraud is open daily with the exception of December 25 and January 1. Advance booking is required. Plan 1.5 – 2 hours for this tasting experience. Château Guiraud is best accessed by car. There’s this misconception about wine tasting, especially here in Bordeaux. Long gone are the days of a stuffy affair of swirl, sniff and sip that was only for wine connoisseurs. 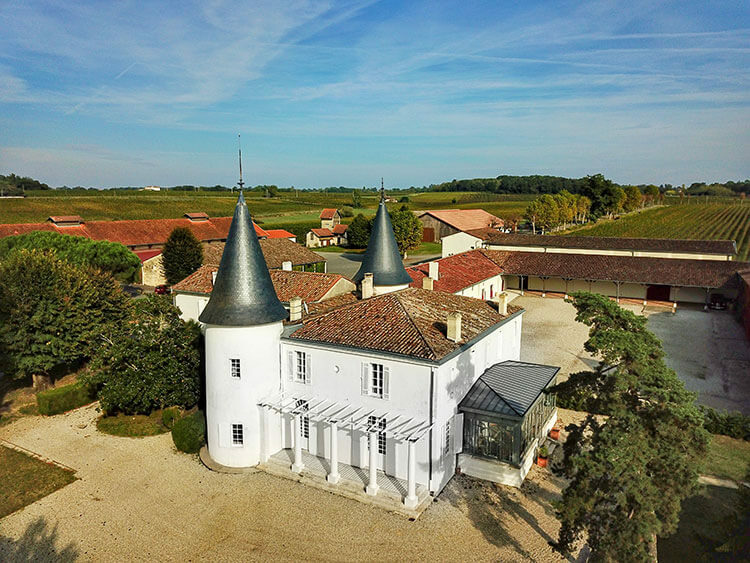 Châteaux are shaking things up, and one of the most adventurous and fun-loving châteaux in the Bordeaux wine region is Château de Rayne Vigneau. The château actually appears twice on this list, first with the most adventurous wine tasting tour in Bordeaux: a tree top tasting in Château de Rayne Vigneau’s 200-year old tree. This particular wine tasting experience definitely isn’t for everyone. You work for your wine tasting using the very type of climbing equipment arborists use, which is a static rope with a pulley system to hoist yourself up. 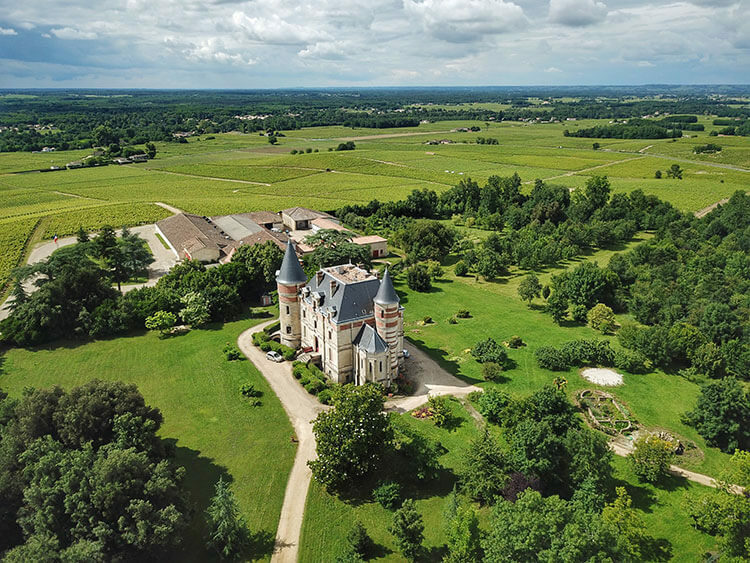 But the reward of a birds-eye view over the château, which the family still lives in and is otherwise mostly hidden by the tall trees surrounding the winery, is totally worth the effort. This tree top tasting of Château de Rayne Vigneau’s 1855 Premier Grand Cru Classé is the finale of the classic tour around the estate. It’s best done early in the morning before the day gets too hot and when weather conditions are most stable. Tasting in a Treetop is available by reservation only and must be booked at least 10 days in advance. Plan 2.5 hours for this tasting experience. Wear pants and closed-toe shoes like tennis shoes for this tasting. Château de Rayne Vigneau is best accessed by car. Escape room games have become all the rage. We’ve tried them all in Bordeaux. From the popular Escape Hunt, which is can be found in cities around the world, to the Escape Road mobile escape game that has frequented the Bordeaux Food Truck Festival, we love solving a good mystery. We love it even more when we can combine a fun time racing against the clock with wine tasting. Château de Rayne Vigneau does just that with their Sweet Escape game. The year is 1940 and château owner Viscount Gabriel de Roton has declared a deposit of semi-precious stones has been found on the estate. As you’ll learn on the classic part of the tour before putting your detective skills to work, Château de Rayne Vigneau really does have semi-precious gemstones mixed in with their soil and it’s part of what makes this 1855 Premier Grand Cru Classé Sauternes unique. In the game, you’ve got to discover all 10 types of semi-precious gems present in order to unlock the bottle of Château de Rayne Vigneau for your tasting. Though we solved it, we suspect even those who don’t are still rewarded for their efforts in this Bordeaux wine tasting tour meant to be enjoyed by a group of friends. A Sweet Escpae is available by reservation only. You need a minimum of 3 people, though 4 is recommended for the escape game, and a maximum of 8. Plan 1.5 hours for this tasting experience. Château de Rayne Vigneau is best accessed by car. We easily think Sauternes is one of the most beautiful appellations to visit. Particularly Bommes, where there’s a concentration of gorgeous castles surrounded by vines, is stunning. Château Sigalas Raubaud, an 1855 Premier Grand Cru Classé, has a bevvy of beautiful neighbors that their terrace looks out upon including Château Rayne de Vigneau and Château Lafaurie Peyraguey. After a classic visit that takes you through the family-run estate, a gourmet Sauternes pairing picnic awaits. It’s truly all about la joie de vivre as you sit down with the owner and enjoy a variety of Laure’s own recipes. Five wines of the château are paired with seasonal dishes. You’ll be shocked at the versatility of Sauternes when you break away from the classic pairings and stop thinking of it as a dessert-only wine. Not to mention that there’s not many châteaux where the owner themselves will sit down to lunch with you. It’s an experience where every guest is made to feel like a VIP. The Gourmet Bites pairing picnic is available from Monday – Friday at 11:30am. It includes the visit and lasts about 2.5 hours. Reservations are obligatory and must be made no later than 1 day in advance. Château Sigalas Raubaud is best accessed by car. Some of France’s most luxurious things come together with the marriage of wine and glass at Château Lafaurie-Peyraguey. Owned by Lalique wine aficionado owner Silvio Denz, there’s unsurprisingly touches of Lalique woven in to nearly every detail of the château, including the iconic muse with grapes that adorns every bottle of Château Lafaurie-Peyraguey. What’s especially exquisite at Château Lafaurie-Peyraguey is the Restaurant Lalique, who impressively secured their first Michelin star in less than a year after opening. The food is truly art and every course is expertly paired with wines from across Silvio Denz’s properties, including Château Faugères in Saint-Émilion and the wines of Château Lafaurie-Peyraguey. 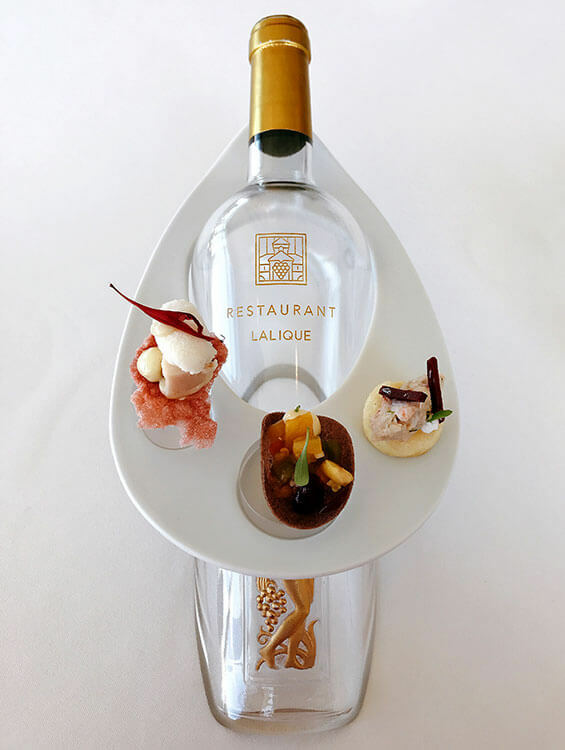 Restaurant Lalique is truly something special and easily one of the top restaurants in the Bordeaux wine region. Château Lafaurie-Peyraguey visits are by appointment only from Monday – Sunday from 10am – 6pm. Restaurant Lalique is open for the lunch sitting from 12:30pm – 1:30pm and the dinner sitting from 7:30pm – 9:30pm. The restaurant is closed on Tuesdays and Wednesdays. Reservations required. The château is best accessed by car. This article contains affiliate links. When you book on Rue des Vignerons or LaFourchette through our affiliate site, we earn a small commission at no additional cost to you. We visited Bordeaux for the first time last year and realized quickly…so many chateaux so little time! These are all great recommendations which simply tells us we need to get back ASAP! Yes, there are so many you could visit! Only a fraction of the over 7000 are open to the public, but it would still take you years to see and visit all of those. All of these experiences sound wonderful! I’m really drawn to the 5 Senses Tour at Château Pape Clement and Vitishow sounds like so much fun! (You know I love Entre-Deux-Mers.) 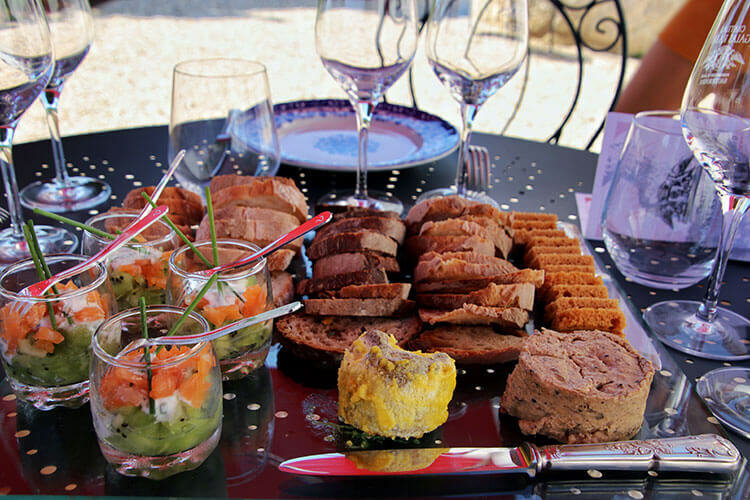 And Sunday Brunch at Château Ambe Tour Pourret…oh and the Treetop Tasting! It all sounds amazing. The Sunday brunch is nice! We go a few times each season. It’s a lovely way to spend a Sunday outside of the city. It’s about 5 hours from Paris which is always our base. It may be doable to visit one or two. 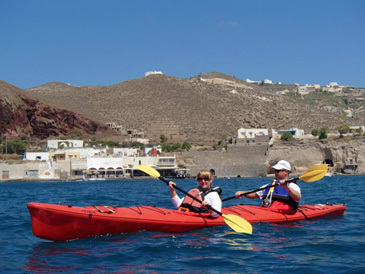 You have described such great wine tours here. My husband always loves them. Hard to choose though. Actually, Bordeaux is just under 2 hours by the fast train that was installed in 2017. There are regularly tickets for less than 20 euro each way, so you could easily make a day trip out of it. I love visiting my neighbours over the water (I am from Britain) checking out the castles there, however I never done a wine tasting in one and this does appeal to me. Hoping to be in the Bordeaux region soon (one part I never explored in the country) and cant to explore the region. Wow! These sound like some amazing experiences! The 5 senses tasting and the Sauternes and cheese tasting both really caught my eye. These are a stark contrast to the quick bus tour I did when visiting Bordeaux many years ago, during a post college whirlwind tour of Europe. The coach tours really just don’t a visit to Bordeaux justice. We don’t recommend them. It’s too large of a group and you go to the same handful of chateaux that everyone sees for shortened visits. I don’t drink at all, but these are beautiful pictures and I think it would be fantastic just to visit for the beauty and also that brunch at Château Ambe Tour Pourret or the cheese at Château Guiraud. The French certainly know their pastries and cheese. Probably wine too, but I don’t know for sure. My mom doesn’t drink, either. She still enjoys visiting the chateaux when she comes to visit. Sometimes grape juice will be offered to non-drinkers. And if you’re properly tasting, you’re actually spitting after swishing the wine around your mouth anyway. I only live 2 hours from Bordeaux and all this beautiful wine, but don\\\’t get there often enough. The tree top tasting at the Château de Rayne Vigneau sounds out of this world! I\\\’ve been wanting to visit Château Ambe Tour Pourret for a while, and would love a brunch tasting there! I’m such a huge Bordeaux wine fan!! These Chateau’s are such perfect places to have these wines and good book and just chill! I wanna try this experience in the future!! Well, they aren’t places you could just go with a book and park yourself. You could do that at some wine bars in the city of Bordeaux, but chateaux are places of business that stop all of their wine making activities to welcome visitors for the tour and tasting. There’s a few exceptions with the handful of chateaux that also operate as a bed & breakfast, and guests would certainly be welcome to relax in guest areas with a book or what not. Thank you, Jennifer! Wine directly bought from wineries are the best. There’s something about the experience that makes the wine taste 10 times better.